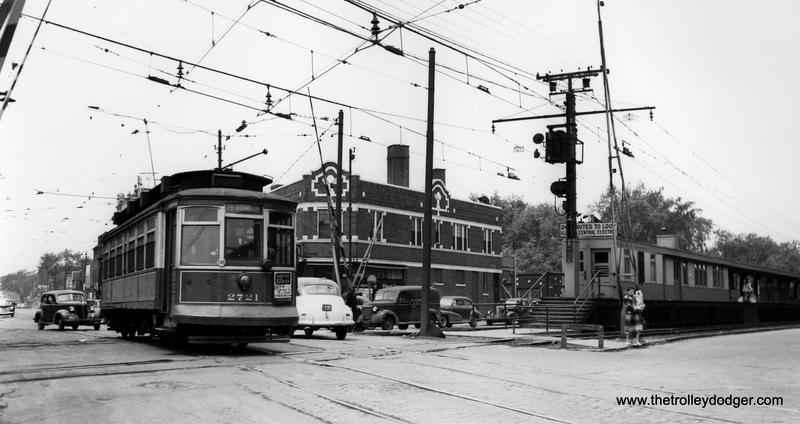 It’s August 28, 1936 on north Ashland Avenue, and time for a parade. 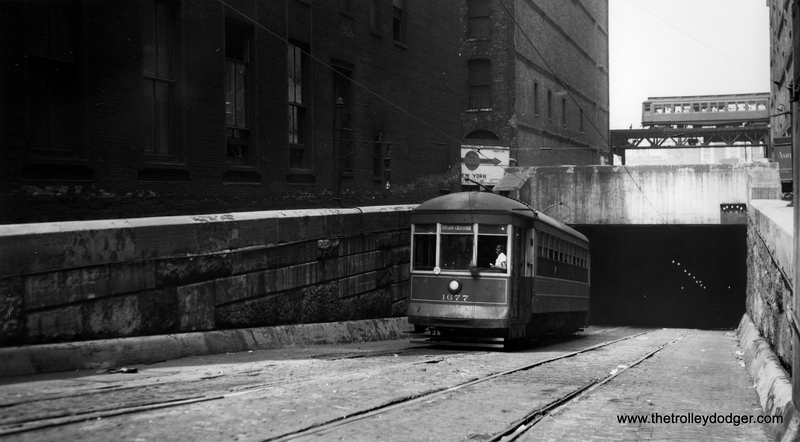 One week earlier, streetcar service had been extended north of Cortland in one of the final extensions under CSL. 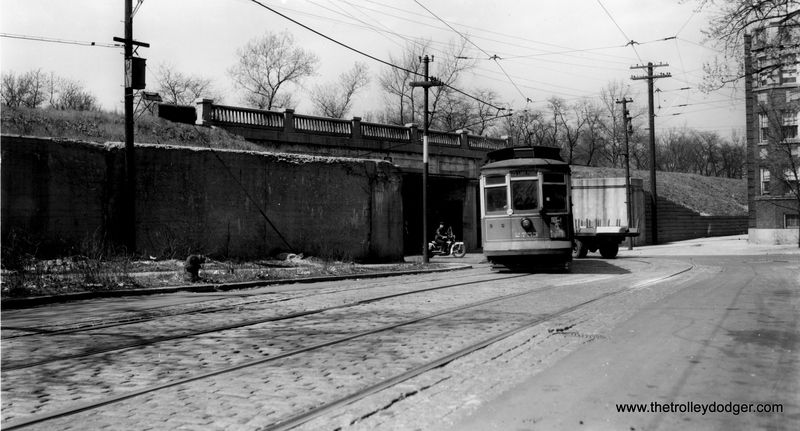 Prior to this time, this portion of the route had run on Southport, two blocks to the east. 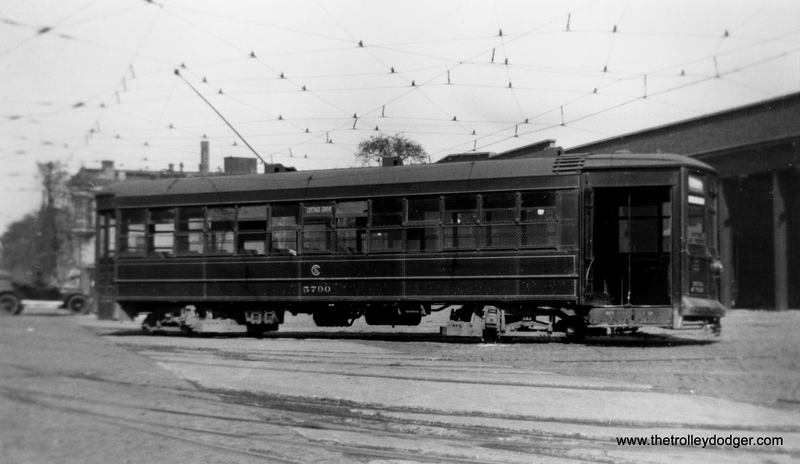 North Chicago Street Railroad “Bombay roof” horsecar 8 is ahead of the experimental 1934 Brill pre-PCC car 7001. Ironically, the older car survives at the Illinois Railway Museum, while 7001 was scrapped in 1959. 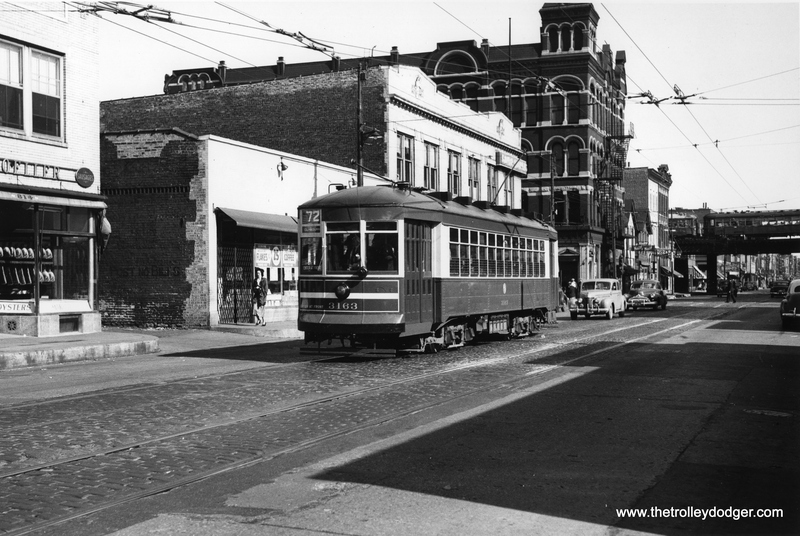 On the other hand, Mike Franklin writes: “Dave, the top photo is taken at 8537 S. Commercial, Chicago. Schmidt Cleaning and Dying. 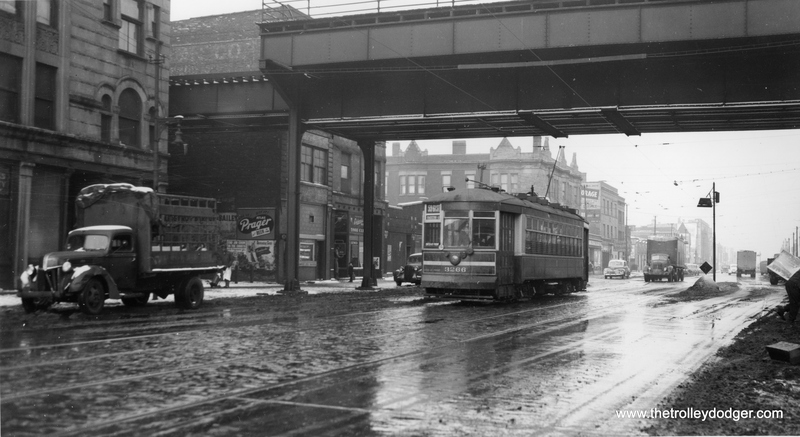 It is not Ashland Ave. Do Google Earth and it all makes sense.” If you are correct, then this picture was probably misidentified, and the parade actually took place around May 2, 1937, when the east and west portions of the 87th Street route were connected via a through route. Thanks for your detective work. 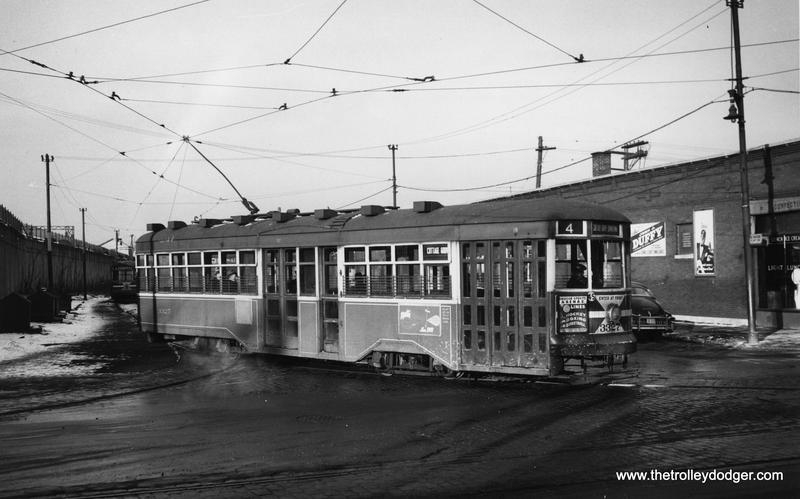 Our earlier feature Chicago Streetcars in Black-and-White has been very popular, so here is another heaping helping of classic photos by some of the greatest railfan photographers of all time. As always, clicking on each picture will bring up a larger version in your browser. If you can share some interesting tidbits of information about these views, we look forward to hearing from you. 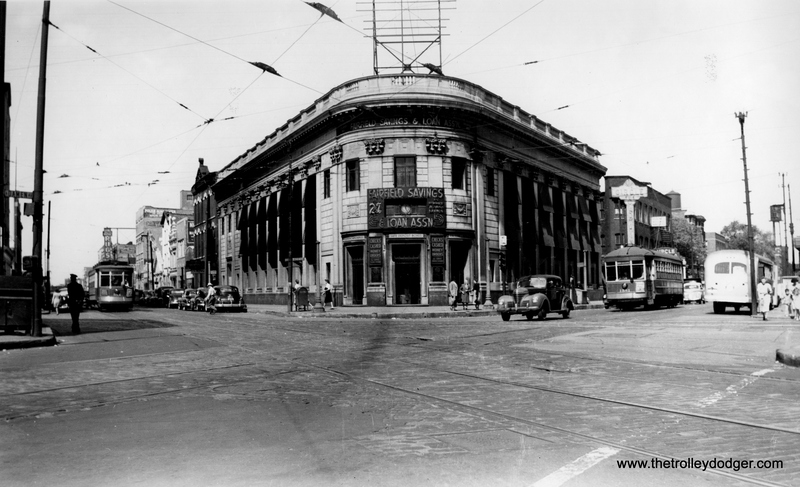 It’s February 22, 1950, looking south on State Street. 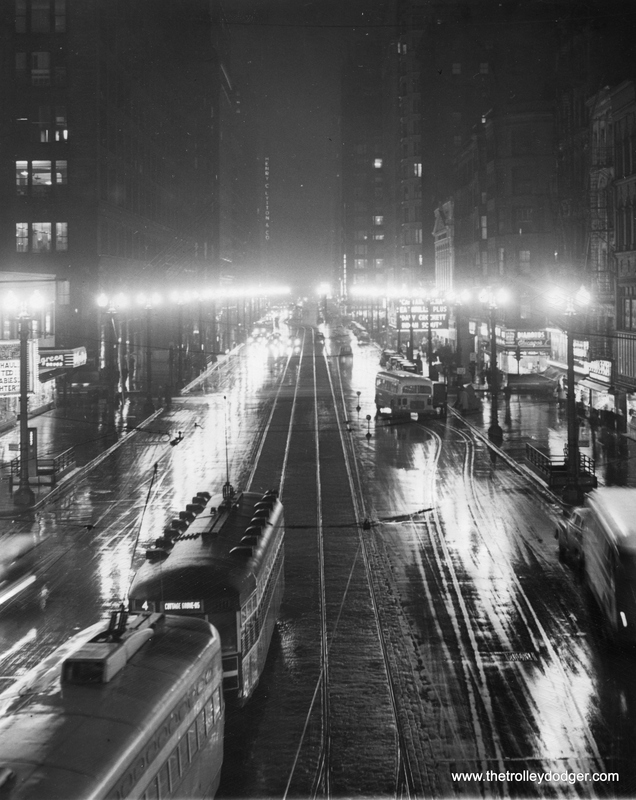 “Chicago’s famed State Street gleams with all its brilliance before half of the lights were turned off to save fuel as the Coal strike cuts Illinois’s output of coal 95 per cent. The State Street Lighting association began a 50 per cent voluntary dim-out of the street to save meager fuel supplies. The PCC is on route 36 – Broadway-State, while the Peter Witt is on route 4 – Cottage Grove. CSL 5533 is eastbound on 63rd Street at Cicero, passing Midway Airport. 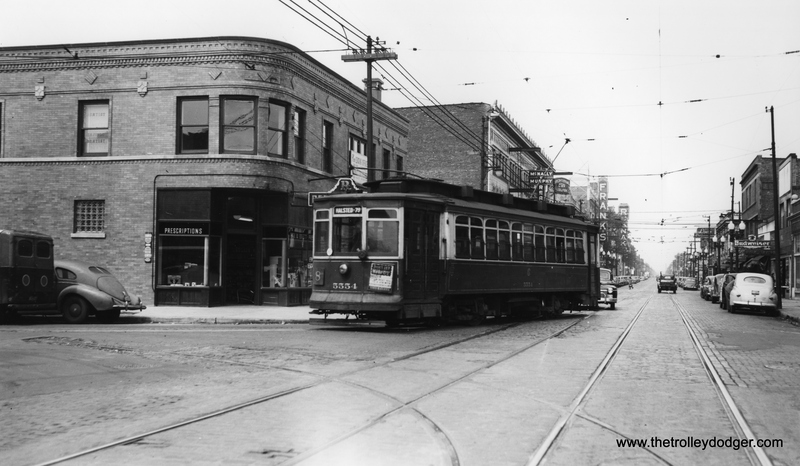 This photo must predate 1914, when the Chicago Surface Lines came into being. 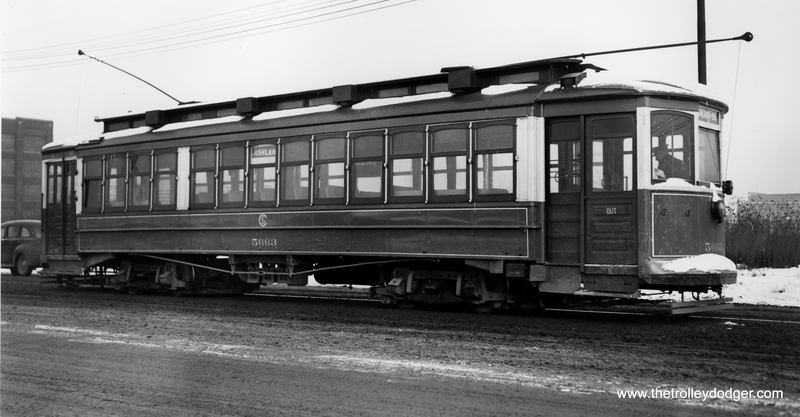 According to Don’s Rail Photos, “1st 5201 thru 5250 were built by Brill-American Car Co in 1906, (Order) #15365, for CCRy as 5201 thru 5250, but it was shipped to United Railroads of San Francisco due to the earthquake. 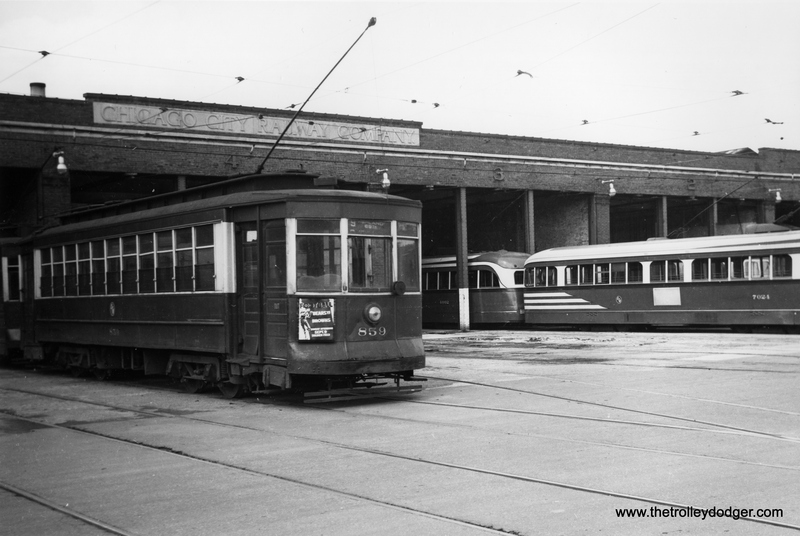 CTA red car 859 and prewar PCC 7024 are on hand at the 70th Street end of 69th Carhouse. 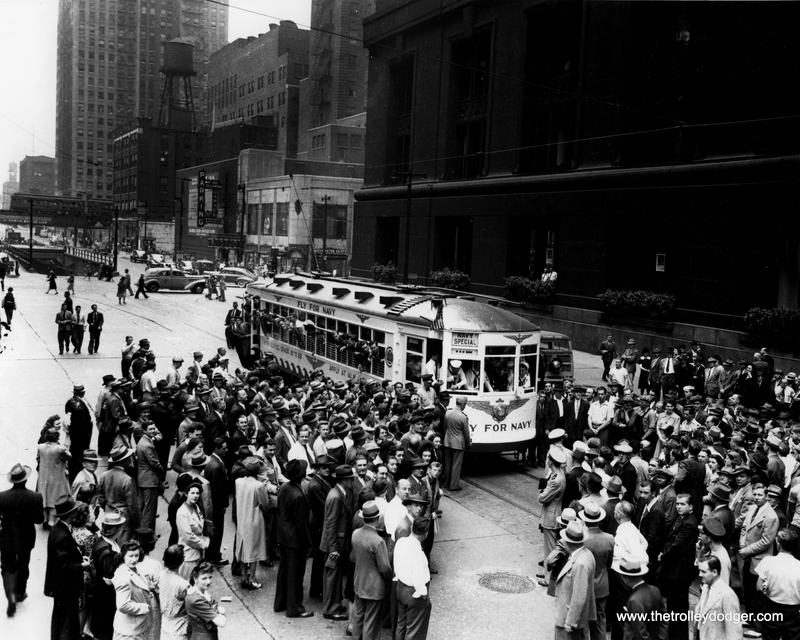 CSL 1775, recruiting for the Navy, is southbound at LaSalle and Randolph in October 1942. North and Halsted as it looks today. The “L” makes a “triple curve” here. 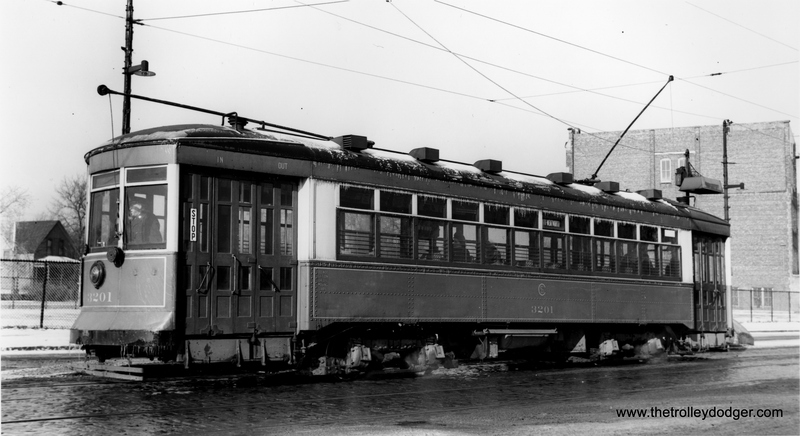 CSL did not paint their streetcars red until the early 1920s, when it was done to make them more visible to motorists. Before that, the standard CSL color was a dark green. 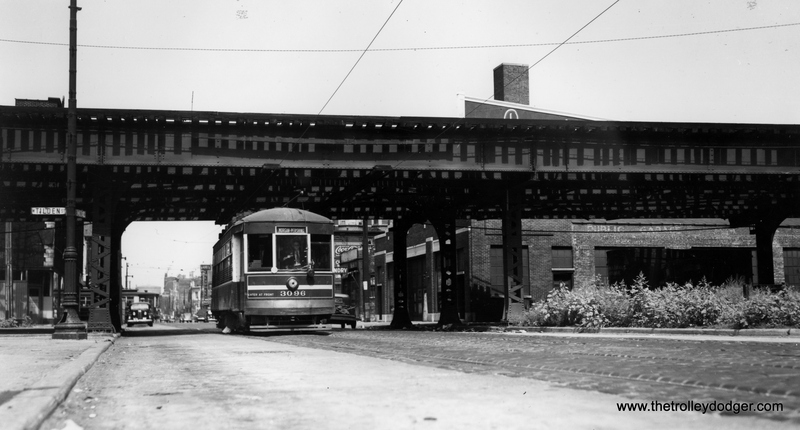 Dearborn Station as it appeared in the mid-1920s. This picture was most likely taken on a glass plate negative. CSL 1776, in patriotic garb, at West Shops in 1944. Those 17-year-olds who decided to study electronic engineering would be 88 years old today. Several comments – the scene on State St with the Cottage Grove car is looking South, not north. 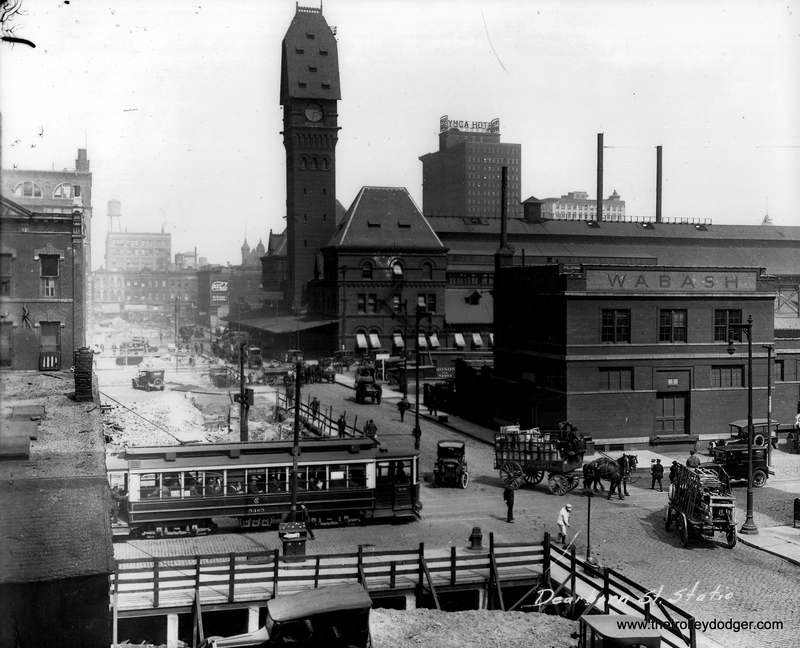 At the time, Cottage looped via Harrison-State-Lake-Wabash, and we are looking down from the State/Lake Inner Loop station. Second, the barn scene with 859 is the 70th Street end of 69th Carhouse. Thank you for your corrections. I have changed the captions with this useful information. 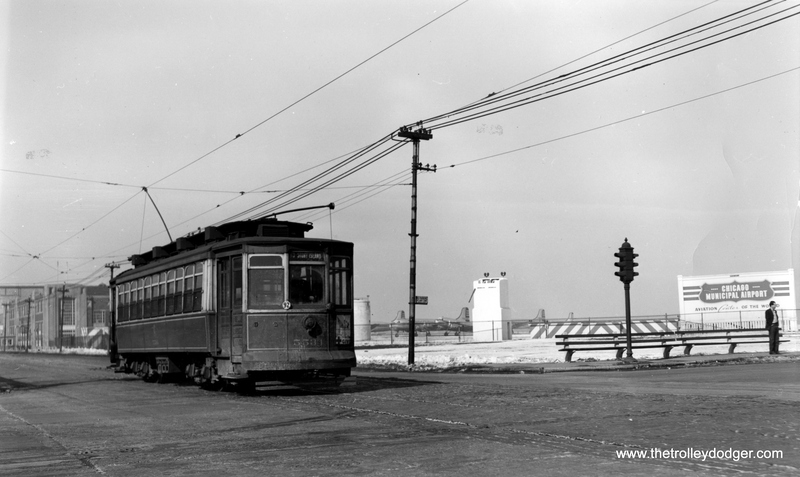 For your enjoyment, we are “reblogging” a post from http://www.thetrolleydodger.com, written by MCERA David Sadowski. The shot of CSL 2619 was taken at the crossing of the Brandon-Brainard line and the Calumet Western RR near 130th and Brandon. Thanks for sharing! I see there are two shots of CSL 2619. Sorry for my confusing remarks. The front-on shot of southbound 2619 was at the Calumet Western (jointly owned by PRR, IHB and Rock Island) crossing near 130th and Brandon. 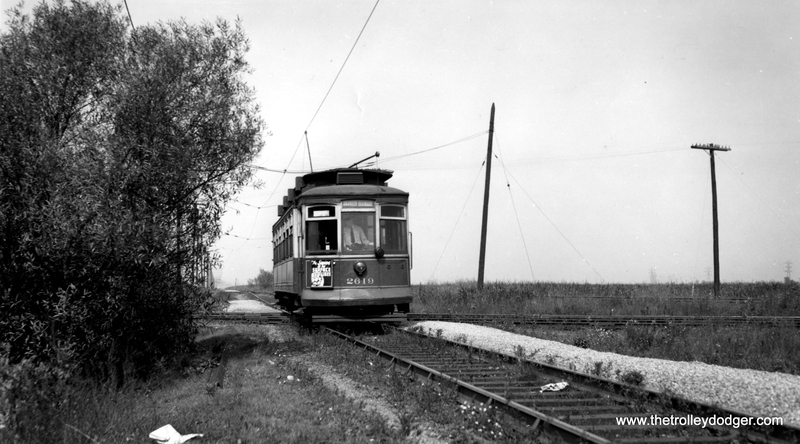 PRR’s Calumet River line can be seen in the background and was also crossed just a short distance north of the Calumet Western crossing. Note the gravel walkways for the conductor to check for opposing traffic on the side of the track. 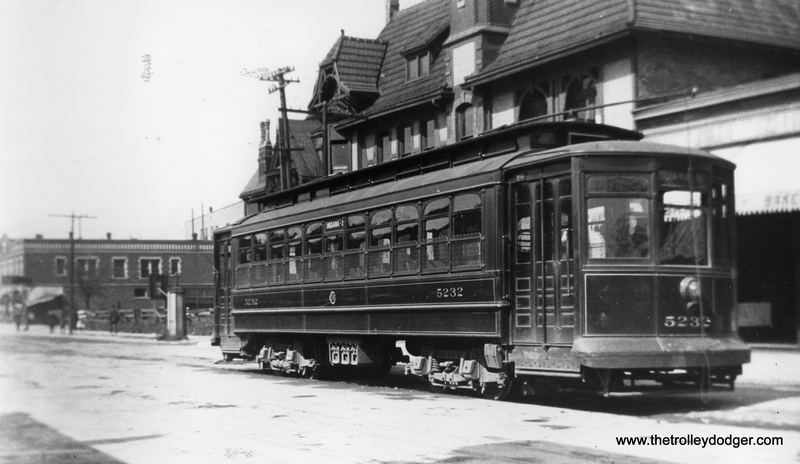 The northbound photo with the conductor looking out the back of the car was taken at 122nd St. The track in the immediate foreground was a passing siding on the Brandon-Brainard line. 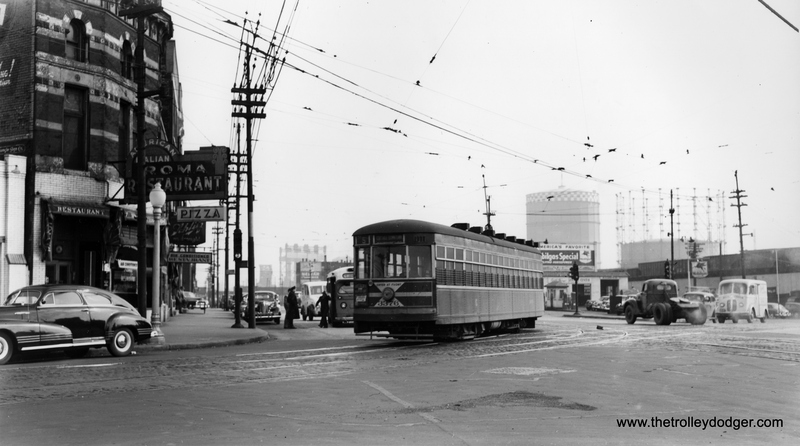 The PRR Calumet River line can be seen in the background. 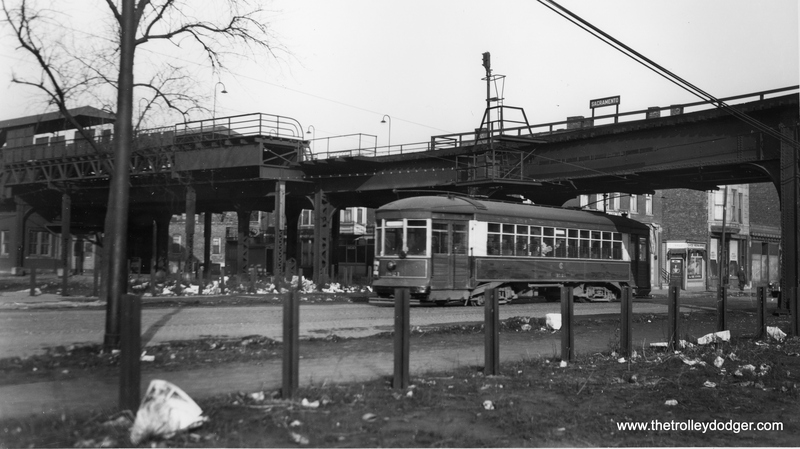 The crossbuck seen to the right of the car protected the 122nd St crossing of the PRR Calumet River line. Republic Steel is seen in the background. I left comments about the two photos in different places. Sorry for the confusion I caused. I’m still trying to figure out how to navigate on your site. OK, thanks. Now I see what happened. It’s in Chicago Streetcars in Black-and-White, Part 2. Since there is a railroad crossing in both pictures, perhaps they were taken at approximately the same location, looking in different directions. The posts on this blog are something akin to magazine articles. You can view the posts sequentially, in a kind of reverse order with the most recent post at the top. You can also view the posts by general categories. You can also do keyword searches to look for individual words, phrases, numbers, etc. However, when you comment, that is directed at one blog post at a time. So if you have a comment about a different post, please make your comment there instead. OK Trolley Dodger, I’m getting the lay of the land now. The photo of SB 2619 in this blog was taken near 130th St. The Brandon-Brainard line crossed two steam railroads near 130th St, the Calumet Western and the PRR-Calumet River line. The crossings were very close to each other as the junction between the Calumet Western and the Calumet River RR was a very short distance to the east. If you zoom in on the photo of 2619 in this blog you can see both crossings. I hope that makes sense. I would like some info if anyone has it. 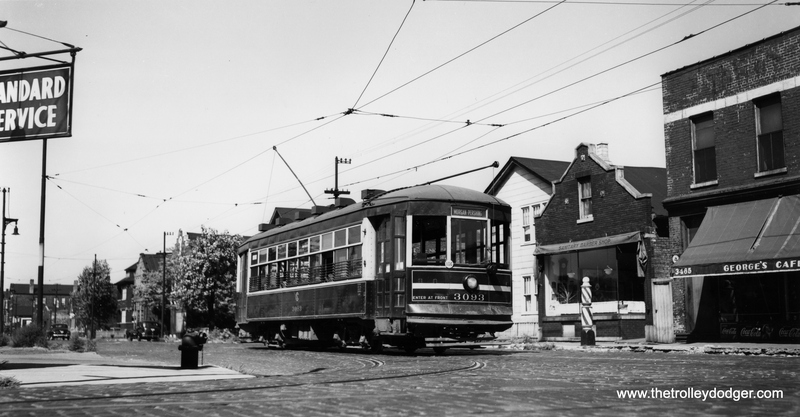 Does anyone know the route that street car 3096 ran? I know there is a picture of the car going down Morgan street. 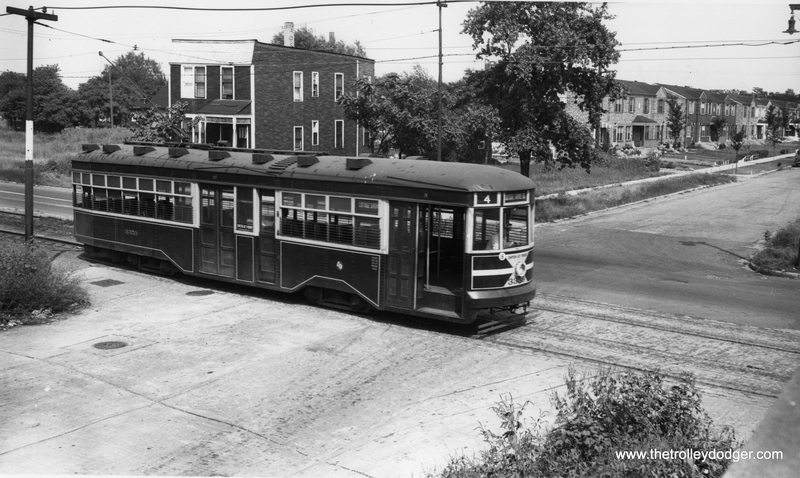 I have a photo of the same street car going down a place called HOGANS ALLEY in Bridgeport. I believe the route cut from Archer to 31st street to Morgan. I am trying to find out where HOGANS ALLEY was? CSL switched to red and cream in early 1921. 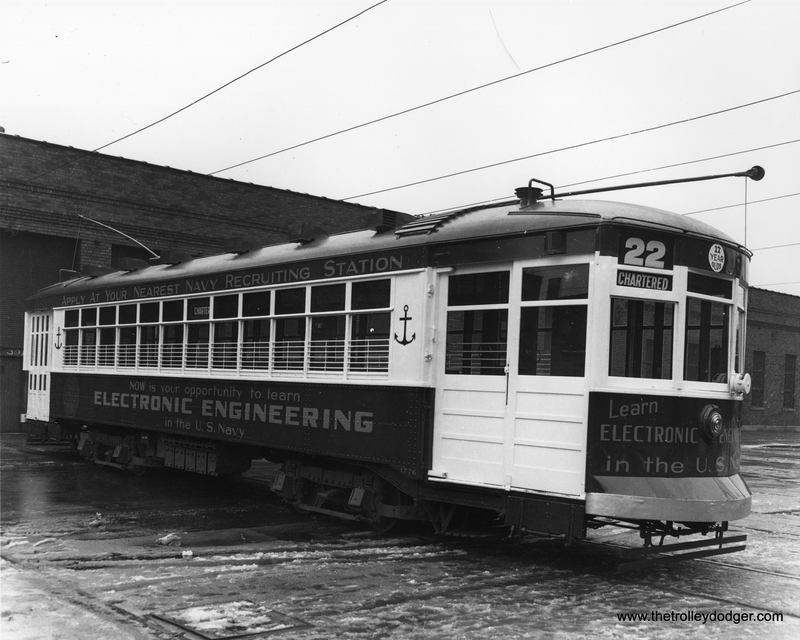 Electric Railway Journal published a small article March 19, 1921. At that point cars were being painted at the rate of 18 per week and 100 cars were in the new livery. Dave, the top photo is taken at 8537 S. Commercial, Chicago. Schmidt Cleaning and Dying. 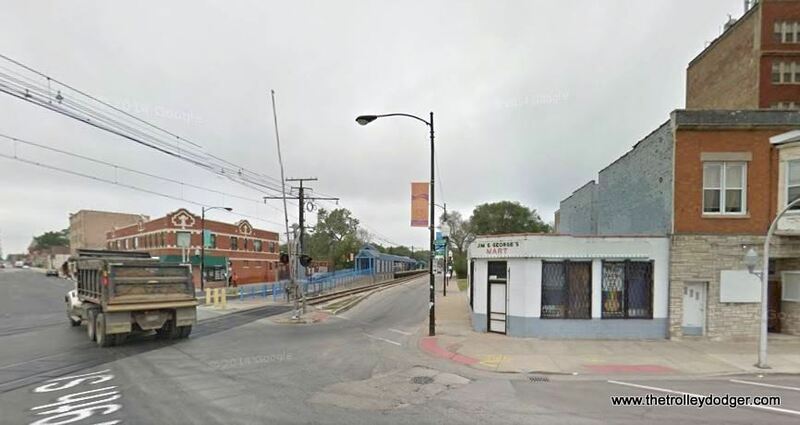 It is not Ashland Ave. Do Google Earth and it all makes sense. 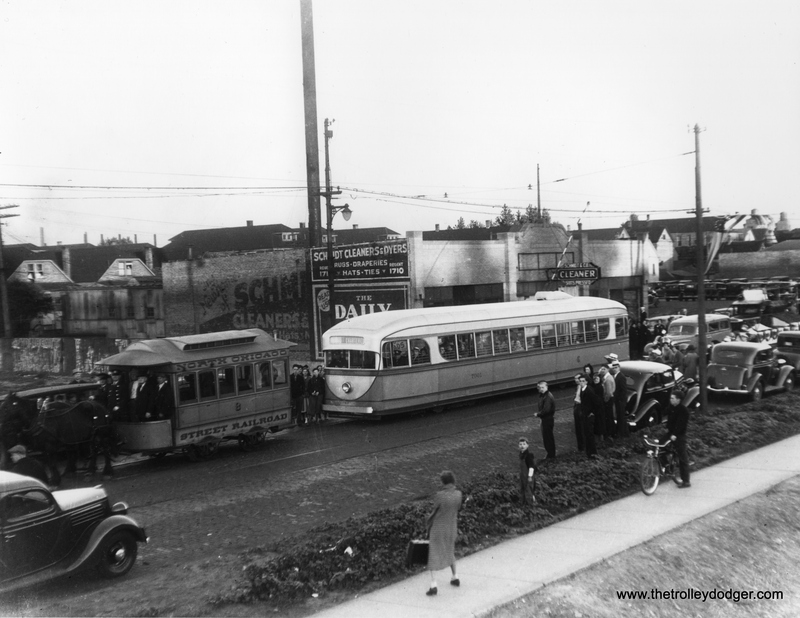 If you are correct, then this picture was probably misidentified, and the parade actually took place around May 2, 1937, when the east and west portions of the 87th Street route were connected via a through route. Thanks for your detective work.